WASHINGTON—Responding to an unsettling incident that has raised concerns about worker exploitation within the organization, the Occupational Safety and Health Administration announced Friday it was launching an investigation into working conditions within Habitat for Humanity after a 92-year-old laborer reportedly collapsed on a job site yesterday. “According to the shocking and disturbing reports we have received, it appears that an elderly man in his 90s—who was observed to be exceedingly thin and frail—was being used as a manual laborer at a residential construction site, where he eventually succumbed to exhaustion and dehydration,” said agency spokesperson Jillian Rogers, adding that authorities were “sickened” to discover records showing that the nonagenarian laborer had been performing blue-collar work for the organization for over 30 years, and had been transported from one construction project to another—sometimes internationally—without any compensation. “This man appears to have had minor farming and public service experience, but no serious construction training. 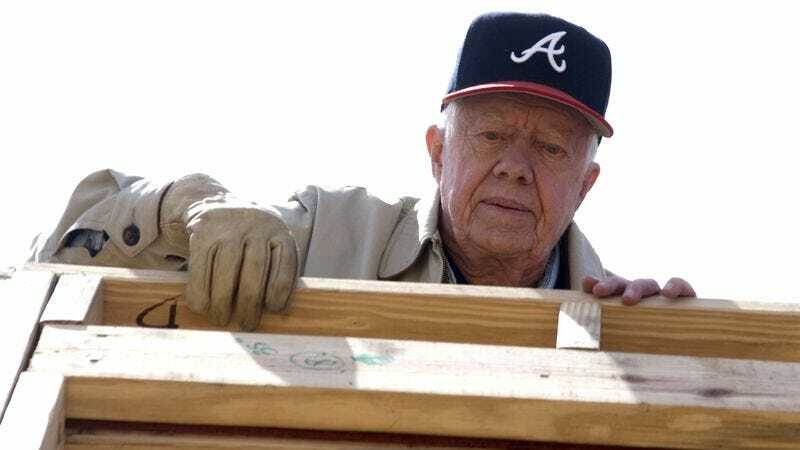 Nevertheless, this organization continued to rely on him to perform a variety of carpentry, masonry, and roofing duties despite his advanced age and limited physical abilities. We’re glad this came to our attention before it was too late for this unfortunate senior citizen.” At press time, witnesses reported seeing the gaunt old man being forced onto a plane to go dig wells and lay pipe at a rural African project site just hours after being released from the hospital.